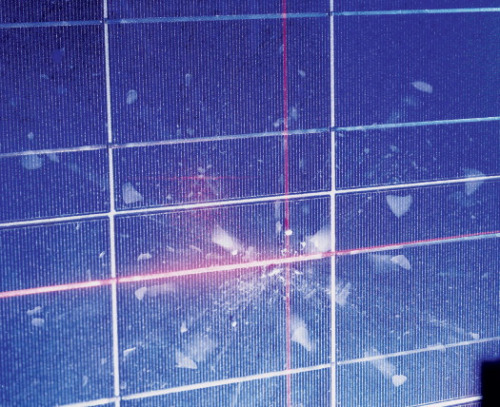 The Photovoltaic Durability Initiative leverages the extensive testing capabilities of the Fraunhofer Institute for Solar Energy Systems (ISE), Europe's leading solar research center. Although still in the research stage, several new solar-related technologies are close to becoming commercial reality. The largest solar energy research institute in Europe is the Fraunhofer Institute for Solar Energy Systems, headquartered in Freiburg Germany. Its director, Professor Eicke Weber, says the key focus is to bring solar PV costs down while increasing system efficiency. In this regard, it is working on new approaches to crystalline silicon (c-Si) technology and concentrated PV. “Although c-Si cell structures are a mature technology, there are plenty of bright ideas to enhance solar cell efficiency and push it closer to the theoretical limits,” Weber says. The use of lasers to make isolated contact points is a case in point. After the deposition of a dielectric passivation layer and a metal layer on top, a Nd-YAG laser is used to alloy the contact points through the dielectric layer. “Rather than covering the whole solar cell with aluminum, this concept creates contact points using a laser,” Weber explains, noting that passivating the areas between the contact points minimises “detrimental carrier combination”. Upgrading metallurgical silicon or UMG-Si is another promising focus. “This is created by chemical treatment (doping) of a metallurgical silicon melt, avoiding the use of a tri-chloride liquid state that has to be evaporated. This UMG-process creates a silicon that is 99.999% pure,” Weber says. On the US side, the Fraunhofer Center for Sustainable Energy Systems (CSE) – an applied research and development laboratory dedicated to the commercialisation of clean energy technologies, based in Cambridge, MA -is working on a technology to validate lifetime for solar panels. Participating companies get performance data for their specific products alongside anonymous data from other companies tests, enabling them to see how they stack up against products on the market. Lifetime performance is a critical element of calculating levelised cost of electricity (LCOE). “As we move toward hundreds of gigawatts installed worldwide, the whole mindset of solar will have to shift to delivering low LCOE. It will be the overall lifetime, performance stability, and ROI that will dominate,” Kinsey concludes. Case study: Potential organic PV breakthrough? Darling has been working on OPV at the CNM for several years. “Silicon energy payback is measured in years, OPV in weeks. If we achieve the performance metrics we believe we can achieve, it could even be as short as a few days,” he says. The work at Argonne is focused on rationally understanding connections between materials and performance. This is much more difficult with OPV than with silicon or other forms of PV, according to Darling. “OPVs are more complex materials. One of the things most strongly connected to the performance is the morphology of the active layer. This is made up of two or more active materials,” he explains. How those are mixed together on a small length scale, even the molecular scale, is key to how they function. “But seeing that structure is a challenge, which is why people historically have not done much of this,” Darling says. There are many different length scales that are all important. Also, all these structures are buried inside the material so surface characterisation alone can not be used to figure it out. “The biggest problem is that all of the materials are all based on carbon, so there is very little contrast. We're using some very advanced characterisation techniques to create contrast so we can see the differences between the materials, see inside to eliminate the challenge of buried structures, and to see all these length scales all the way from the molecular up to the larger structures,” he says. Check out our other Solar PV articles here. In part 2. George Marsh looks at some other novel technologies under development.